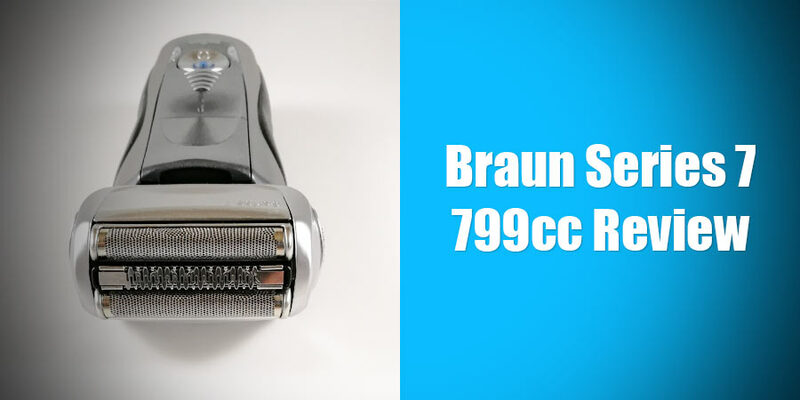 The Braun Series 7 799cc is one of the quintessential Series 7 models and represents a minor upgrade of the highly acclaimed and popular Series 7 790cc. What the 799cc brings to the table is the ability to be used wet & dry, while its predecessor was only suitable for dry use. So on a first look it appears to be a worthy successor, but there’s more than meets the eye. Let’s find out how the 799cc performed during our extensive review. Wrapup — Who should buy the 799cc? The new 799cc is entirely based on the 790cc and apart from the fact that it’s now officially approved to be used for wet shaving, it is an (almost) identical product — we’ll get to the almost part in the next section. It comes as no surprise that we’ll find the same technologies used here as well. And considering that the performance of the old razor was excellent, that’s not a bad thing at all. Let’s take a quick look at the most important ones. By using micro-vibrations, almost 10 000 per minute according to Braun, the head of the shaver will oscillate and supposedly capture the hairs more efficiently. 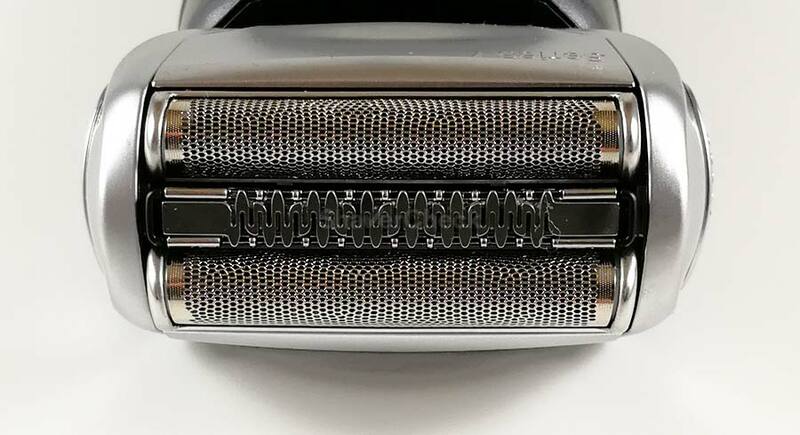 This, along with the specially designed foil, makes the Series 7 pretty efficient at capturing stray hairs, the Achilles’ heel of almost all electric razors. Another common problem has to do with hairs that grow parallel to the surface of the skin and tend to lie flat. The 799cc, just like any other Series 7 model, features a middle trimmer that lifts the hairs and cuts them down to size. After that, the two OptiFoil can easily intercept them and cut them close to the skin. This is the name that Braun uses for the perforated foil of its shavers. It features hexagonal holes and, at least in theory, should be superior to ones that have round holes by reducing the space between these perforations. A pattern comprised of hexagonal shapes apparently uses the available space more efficiently. The cutting head of the Series 7 is actually pretty basic when compared to other 4 or even 5 blade razors. Again, that’s not necessarily a bad thing as they provide more than enough cutting power and together with the other technologies they perform very well. The cutting system uses two foil cutters and one middle trimmer. They can move independently, while the whole assembly can pivot back and forth but not side to side. It can also be locked in place when you need more control via a side mounted switch. However, you must be careful when using this feature as applying too much pressure after locking the head into place can break the mechanism. You can choose between Intensive, Extra Sensitive and Normal modes by pressing the two buttons located on the sides of the ON/OFF switch. The three settings are pretty self-explanatory and in theory could be useful in certain situations. Braun shavers generally have very good build quality. The Series 7 799cc lives up to the expectations with a solid construction and high-quality materials. Visually, the Series 7 is not as striking as some other shavers from Panasonic or even Braun’s Series 5 or Series 9. Compared to those, the design of the Series 7 is actually beginning to show its age. The shaver itself has a pretty hefty size, but it’s very comfortable to hold despite the fact that it doesn’t taper at all. Also, because it only has 3 cutting elements, the shaving unit is not bulky and it’s extremely easy to maneuver in tight spots. The rubber inserts on the sides and back provide a very secure grip. The finish of the silver plastic is glossy as opposed to the matte one found on the 790cc. This would be the only visual difference between the two. Overall, the 799cc scores pretty high with its construction and understated design — as opposed to the more futuristic look of high-end Panasonic shavers. On the bottom of the shaver there’s an LCD display that lets you know how much battery life is left and also the hygiene status. The pop-up trimmer is located on the front of the shaver and it works decently for some light grooming like trimming your sideburns. Unfortunately, the Series 7 799cc still doesn’t feature a travel lock. The ON/OFF button is pretty hard to press, but we won’t take that into account. The 799cc comes equipped with a Li-Ion battery that requires approximately one hour to be fully charged and provides enough power for 50 minutes worth of shaving. You also have the option of a 5 minutes quick charge. Charging can be carried out by placing the razor in the charging dock or simply by plugging the cord directly into the shaver; this is very convenient for traveling as you won’t have to carry the station with you. As outlined earlier, due to the fact that the Series 7 799cc is suitable for wet & dry shaving, it cannot be used while plugged in due to safety concerns. In real-world use, the battery life was excellent and it consistently surpassed the claimed 50 minutes of use. Braun’s Clean & Renew Systems are among the best and this one is no exception. But more importantly, they’re practical and necessary. The cleaning cartridges use alcohol as opposed to detergent/soap (like the ones used by Panasonic for example). Alcohol does a great job at cleaning and sanitizing the razor and it evaporates quickly, contributing to a very short drying cycle. The fluid also lubricates the blades, so you won’t have to do it yourself. A cleaning cycle is short and lasts a few minutes, followed by the aforementioned drying phase that takes around 15 to 30 minutes. The whole process is very quiet as well. This is due to the fact that after the cleaning phase, it uses induction heating to dry the shaver (as opposed to running a fan for an hour as it’s the case with other cleaning docks from Braun or the competition). The station will automatically select the appropriate cleaning program (short, normal or intensive) depending on the shaver’s hygiene status. Finally, you’ll end up every time with a squeaky clean razor that has a nice citrusy smell, is fully charged and ready for the next shave. The cartridges themselves are a bit pricey (depending on the number of refills in the pack) compared to other manufacturers, each one lasting for about 30 cycles. 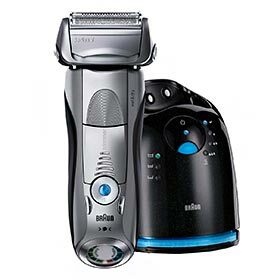 You can save some money by opting for a manual cleaning of the shaver every once in a while, but it is somewhat difficult due to the fact that Braun uses a cassette that is comprised of both foil and cutters and they cannot be taken apart for a thorough cleaning. It’s therefore a good idea to clean your Series 7 using the station (at least a couple of times a month) to avoid hairs and dirt buildups inside the cassette. An important aspect to keep in mind is that alcohol will evaporate in time, so if you’re not going to use the cleaning station for a longer period it’s a good idea to remove the cartridge from the base and put back the cap. You can even go as far as covering the container after every use. Another helpful cleaning tip is to simply remove the foil and cutter assembly and use the included brush to remove most of the hair clippings prior to using the Clean & Renew System. This simple action will make the cleaning cartridge last even longer. As for the downsides, the odd limitation present with all Braun cleaning stations affects this one as well. Precisely, if you use your 799cc with shaving cream or gel you’ll have to manually clean the shaver of any foam residues before using the station. The razor must also be completely dry. And that’s a bit inconvenient as the cleaning station should take care of all this hassle. For shaving dry this is a non-issue, but the only reason you’ll want the 799cc and not the 790cc would be to use it with shaving cream. Panasonic shavers for example can be cleaned with the included station after a wet shave without any risks of clogging the station. Since the 799cc is pretty much the same razor as its predecessor, the dry shaving experience is virtually the same. And that’s not a bad thing at all since the Series 7 in general is one of the best in business. Apart from the closeness, what really sets the Series 7 799cc apart from the competition is just how comfortable and irritation-free the shaving experience is. The foils remain perfectly cool during use and the shaver is very forgiving and gentle to the skin. It performs great when used for everyday shaving and can yield great results even with two to three days of growth. It’s also pretty effective at catching stray hairs or the ones that lie flat to the surface of the skin. The shaver is very gentle to the skin and it often feels more like you’re getting a massage than getting a shave; the only thing that lets you know it’s working is the reassuring sound of the hairs being cut. What probably also interests you is its wet shaving performance. After all, if you’re only interested in using it as a dry shaver you’re only paying extra for a feature you don’t need; the 790cc is absolutely identical as far as performance goes and it costs less. 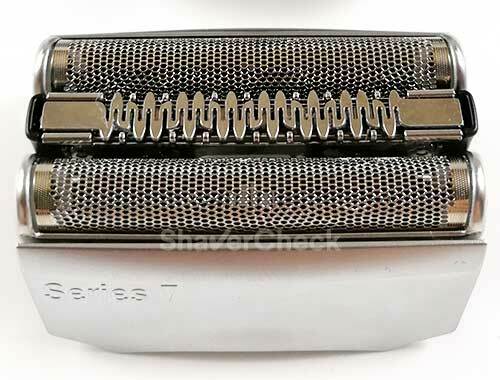 Like I said on multiple occasions, I am a big proponent of wet electric shaving and this has always been my main gripe with Braun’s Series 7: the lack of wet shaving capabilities. It’s also the single reason why I stuck to Panasonic over the years. Luckily, Braun finally came out with a worthy successor of the 790cc and added the benefit of wet shaving. Generally, including a quality shaving cream results in a closer and more comfortable shave. How significant will be this improvement really depends on the individual and the particularities of the skin and facial hair. The only way to find out is to actually try it. Men with very sensitive skin should definitely consider it. So how does the 799cc perform in this regard? Very good, actually. With the addition of shaving cream, it just glides effortlessly on the skin and mows through the stubble; the result is one of the most comfortable and close shaves you’ll get with any electric shaver. Granted, the dry shave comfort was already very good, but with a shaving cream you may get even better results. Which leads me to the cons of the 799cc and of the Series 7 in general. While the closeness will be more than adequate for most men, it’s not the closest shaving razor in this price category. 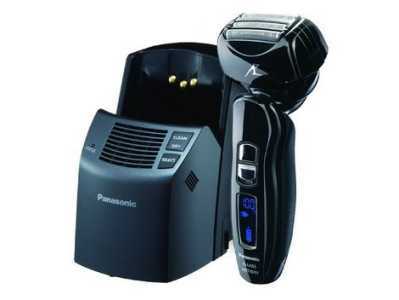 For even less money, a Panasonic Arc 4 or even a second generation Arc 5 will give you a closer shave. More details on this in the alternative shavers section. Braun is usually one of the more generous manufacturers when it comes to including stuff in the package. The foil and cutters assembly (called a cassette) must be replaced once every 18 months; this is a very reasonable period but it really depends on the frequency of use and how coarse is your beard. Moreover, Braun’s replacement cassette is more reasonably priced when compared to other manufacturers. For example, you generally have to spend more money for a Panasonic foil and blade set; moreover, the one from Braun will probably last longer. 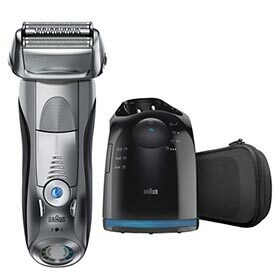 If the Braun Series 7 799cc fits within your budget and you want one of the best razors in terms of comfort and closeness then look no further. If you have sensitive skin, suffer from ingrown hairs or your skin is prone to breakouts you should also consider it. It’s probably a solid upgrade from any other electric shaver that struggles with longer or coarse hair for example. If you tend to shave every two days or even a bit more, the 799cc will most likely handle the job easily. Sporting a bald head? No problem; just apply your favorite shaving cream and start shaving. Again, this is considering that you’ll be using the 799cc with shaving cream on a regular basis. Otherwise, the dry only 790cc is an equally good option that costs less. Considering the performance, quality, costs of ownership, the excellent cleaning system and Braun’s reputation for reliable products that will last for years, the 799cc actually offers good value for money — despite what the price tag may initially suggest. The old Series 7 790cc is mentioned quite a few times throughout this review. And there’s a reason for that, as it’s a great alternative if you’re only going to dry shave. Actually it’s a better alternative since it’s cheaper and the performance is identical. Moreover, you can even shaved with the cord plugged in. There is absolutely no reason to buy the 799cc if you are not planning to use it for wet shaving. Another great alternative, but this time for wet shaving is the Panasonic ES-LA93-K from the Arc 4 line that we reviewed here. Its main advantages over the 799cc are the more powerful motor, an extra cutting element and the more advanced flexing motion of the shaving head. As a result, this Panasonic will shave closer and even faster than the 799cc. Moreover, you won’t have to manually clean the foam before using the station. The price of the cleaning cartridges is also very reasonable. It’s not as comfortable as the 799cc and the foil can get hot during a longer shaving session, but when used with shaving cream it can be perfectly suitable for sensitive skin as well. Finally, keep in mind that Panasonic electric razors are not as good as Braun at shaving longer, flat-lying hairs, so only consider getting one if you’ll be shaving often (daily or every other day at most). Finally, since the 799cc is an older model that being phased out, it’s getting increasingly difficult to find and the price has spiked lately. For these reasons, I don’t consider it a viable option anymore and I suggest checking out the Series 7 7865cc instead. It’s a newer wet & dry Series 7 that’s extremely similar performance-wise, but it can usually be found at a much lower price. Thanks for your excellent review. It was on this basis that I decided to purchase this one as it seemed to hit the sweet spot between price and performance. I just had my first shave with this one today after three days of growth on my face and head. Very smooth shave, no follicle yanking, and does not require a zillion passes over the same patch! Most impressively, this has got to be the best shave I’ve had for the usually stubborn neck area where hairs generally stick out in different directions. A completely smooth neck area! And no stubble left behind. Although the instruction manual suggests locking the pivoting head to get to harder to shave spots, like under the nose, I found I could let the head pivot freely as the range of motion is not exaggerated as one might find on other models. Compared to my previous shaver where it took me over 30 minutes to shave head and face while still doing a poor job, the Braun 7 did it all in under 10 minutes while leaving my skin smooth. This is how a shaver should be! Thank you for your comment. I’m glad to know you found the review helpful and that you’re enjoying your new Series 7. If the Panasonic shaves closer and cost less, why buy the Braun. Isn’t the whole point the close the shave the better? closeness is one of the most important things to factor in when buying a shaver. But for some men comfort is more important than closeness and the Series 7 is better in this regard. When you’re dealing with acne prone skin, razor burn or bumps, you’ll probably want comfort over closeness. Both are very good shavers, they just excel at different things. Thanks so much Ovidiu for the quick comeback and clarification. You answered my question. I ended up buying the Braun Series 7 7899cc. My own error, I thought I clicked on to purchase the 799c and inadvertently hit the Series 7 7899cc. I paid $175 for it. I an pleased with that. I did check after it arrived and saw that it too had great reviews.